July 4 Deployment: Inside the NYPD’s counterterror operation. In the air, over the water and on the street with hundreds of heavily-armed officers, the New York Police Department says it is ready for war if ISIS or any terror group attacks New York City. Some 525 specially trained officers rotate shifts so that at any given time, 24/7, some 100 of them are ready to roll out with high-powered weapons, radiation detectors and bomb-sniffing Labrador Retrievers that can detect the chemicals known to be used by ISIS for its suicide explosives. Tune in to "World News Tonight With David Muir" for the full Brian Ross report. The operation is run from a command center in an undisclosed location in lower Manhattan, where the feeds from more than 9,000 surveillance cameras are piped in and displayed – feeds from the Brooklyn Bridge to Times Square to inside the city’s subways. 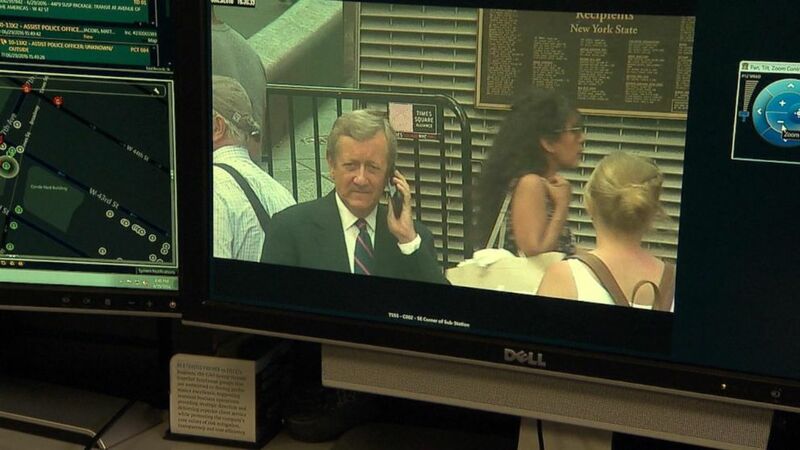 (ABC News) ABC News' Chief Investigative Correspondent Brian Ross caught on surveillance cameras in New York City's Times Square. “It gives us an optic into what goes in New York City on any given day, and it tells us an awful lot with 9,000 cameras and the license plate readers. It gives us a sense to keep our finger on the pulse of what's happening here in the city,” Waters said. The Chief said the security operation as a whole has been referred to as a “ring of steel,” an expansion of the concept first used in London. “It’s our way of protecting New York,” he said. Though officials have said there is no specific threat to New York or any American city this holiday weekend, ISIS has repeatedly called for attacks on the city, and Waters said he always thinks that New York is a prime target. 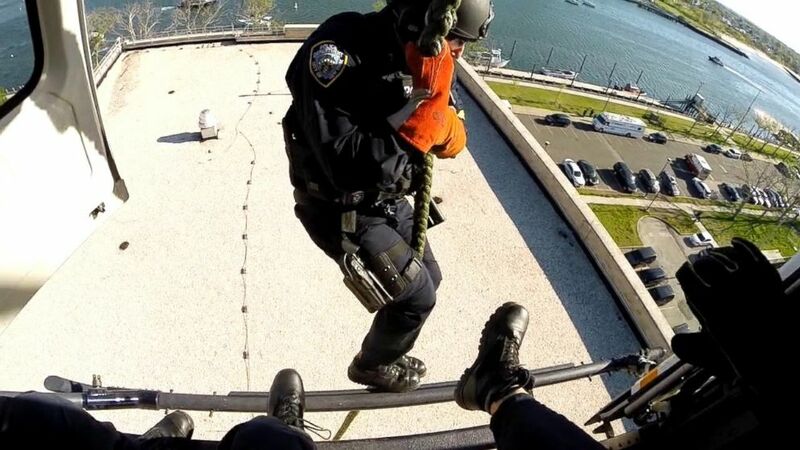 (NYPD / ABC News) NYPD officers participate in a counterterrorism drill in late June 2016. The NYPD intelligence analysts are working around the clock to get ahead of any potential attackers, looking far beyond the city limits to do so. (ABC News) Meghann Teubner is the Director of Counterterrorism Intelligence Analysis in the NYPD's Counterterrorism Bureau. Capt. Gene McCarthy, executive officer in the NYPD’s Critical Response Command, said the department has analyzed recent major terror attacks from the Charlie Hebdo attack in Paris to the shootings in San Bernardino, California and Orlando, Florida. “We are constantly looking at tactics, techniques and procedures that are used at those events and how we can better prepare ourselves here in New York City,” McCarthy said. Critical Response Command was formed in November 2015, just before the second major attack in Paris. The 9,000 surveillance cameras are a mix of NYPD-owned cameras and those owned by “stakeholders,” private entities that provide their feeds to the police. License plate readers on roads can capture three million license plates a day, Chief Waters said, and the plate data is kept for five years. As for fears of Big Brother-style privacy invasion from thousands of lenses, Waters said all the cameras are in public locations. Should someone slip through the cracks and attempt an attack, the NYPD’s “last line of defense” is a unit of Labrador Retrievers that are specially trained to detect explosive suicide vests, according to NYPD Lt. Brian Corrigan, who works with the animals. 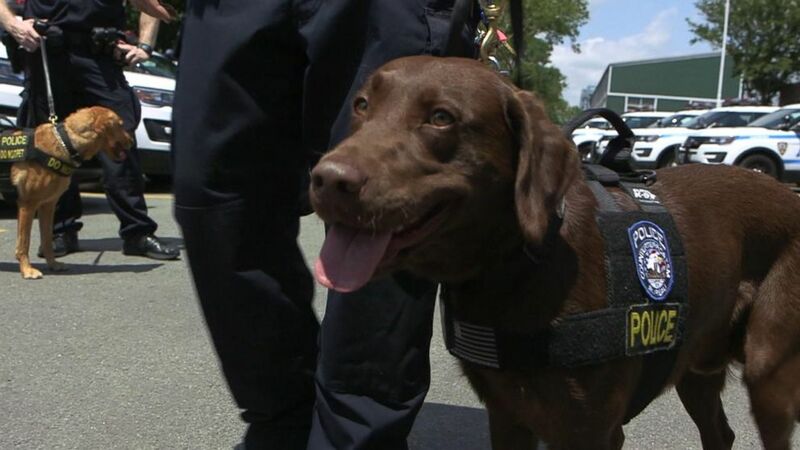 (ABC News) Some NYPD bomb sniffing dogs are specially trained to detect suicide vests or bombs on the move. 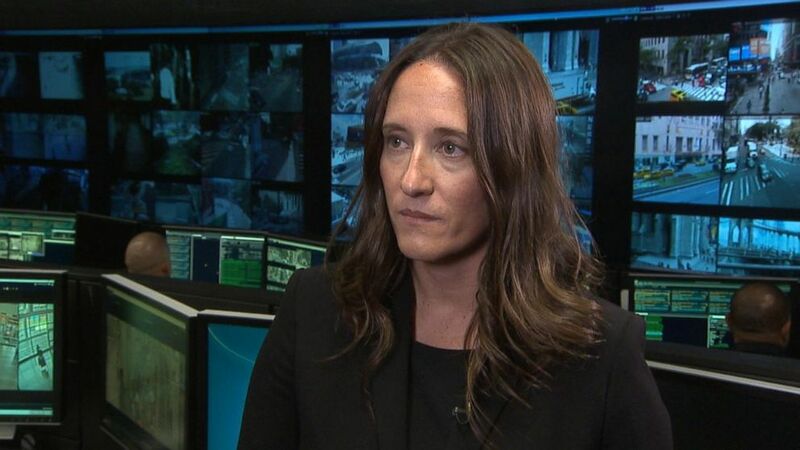 Teubner said recently ISIS attacks abroad prompted the NYPD to operate “in a heightened threat environment” and in a broad sense, she said the threat of attack keeps her up at night. “I think I’ve aged a lot in the past two years, probably have gray hair and wrinkles,” she said, “just to see the shifting threat environment and know the depth and breadth of the threat we face now with a more diverse and diffused kind of threat environment. “But I think the city should feel safe, the people, the civilians walking on the streets, they should feel safe and they should see the presence of law enforcement officers out there doing their job,” she said.